Will Ford's New F-150 Be a Game Changer for Alternative Fuels? Ford's new F-150 is available with propane and CNG versions, in V6 and V8. Will these cheaper, cleaner fuels drive buyers? One thing that stood out at the recent ACT Expo alternative vehicle fuels conference in Dallas was the number of vehicles available from Ford Motor Co. (NYSE:F). Not only does Ford offer the typical hybrid and plug-in electric cars that appeal to many daily drivers, but the Blue Oval also has a lineup of vans, wagons, and trucks that can run on gas and diesel alternatives such as natural gas and propane. Ford's lineup of alt-fuel vehicles is easily the broadest in the industry. Ford's 2016 F-150 is the only half-ton pickup that can run on CNG or propane. Source: Author. The F-150 is one of the best-selling vehicles in North America already, both to individuals and to fleets. The capability to run on CNG and propane adds even more reason for truck users to consider it for their needs. While Ford, General Motors, and Fiat Chrysler Automobiles NV all offer their larger trucks in natural gas configurations, Ford's F-150 is the only half-ton pickup currently available with these options. This is a big deal for truck users who don't need the heavier-duty F-250 or F-350 Super Duty trucks, which have a base sticker price $6,500 higher than that of the smaller, lighter F-150. This is particularly important for users, for example, who might have workers or maintenance crews that need the storage capacity of a pickup, but don't need the 4,000 pounds of payload capacity of the F-250 when the 2,250-pound capacity of the F-150 will do. Factor in superior fuel economy from the F-150, and there's likely to be significant interest in this vehicle. The day after Ford announced that the 5.0-liter engine would be available in gaseous prep, I spoke with Westport Innovations' (NASDAQ:WPRT) Paul Shaffer, who is in charge of the Dallas facility at which Westport's Ford program is based. Westport is the largest Ford Qualified Vehicle Modifier, or QVM, based on both the number of models it can modify and the total number of vehicles that it handles on a yearly basis. ... out of all the OEMs, you have only Ford now offering a half-ton pickup that really doesn't have a competitor. So, you're going to have -- it's going to be better for drivability for your drivers at the fleet level, it's going to have better fuel economy, they're taking about 700 pounds off the weight of the vehicle [versus the 2015 model]. So, your towing capacity isn't really much different than what it is on the F-250. So, there's a ton of opportunities for this to be incorporated into the fleet. I'm talking to them on a daily basis -- not only the fleets, but the Ford dealers and our installers, and fleet partners. I'll tell you, the overwhelming consensus is that they're going to gravitate and move from these [GM and Ram] 2500, or [Ford] F-250 trucks down to the F-150. According to Shaffer, the natural gas F-150 might not be available in quantity until near the end of 2015. Westport -- and the rest of Ford's QVM partners -- will require some time to complete emissions certification, but there is likely to be strong demand for this truck sooner rather than later. Furthermore, Ford is still ramping up F-150 production, and fleet orders (which would be the typical alt-fuel buyer) have taken a back seat so far. However, production at the Kansas City plant is set to increase, which will support those big fleet orders. Westport is offering the F-150 in a dedicated CNG configuration, as well as a bi-fuel version that will run primarily on CNG, then switch to gasoline if the 17- or 23- gasoline gallon equivalent CNG tank is empty. 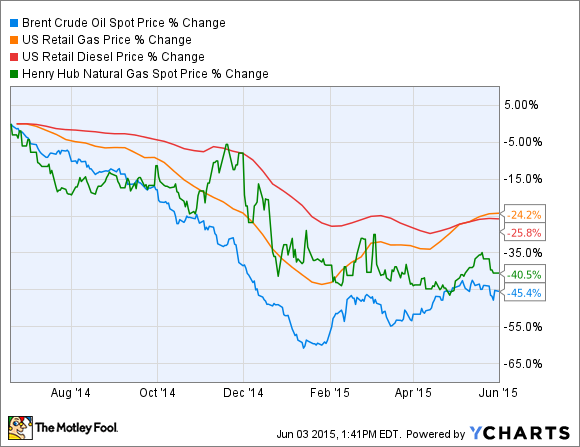 Natural gas wholesale prices have dropped almost as much as oil since June 2014. Like diesel and gasoline, there's also more to the price "at the pump" than just the commodity wholesale price. Still, CNG for transportation has fallen close to 30% since its 2014 price peak, meaning it offers a measurable savings for high-volume fuel users. Propane and other natural gas liquids are a byproduct of both gas and oil production, and have also fallen in price. In other words, it comes down to money as much as anything, though many vehicle fleet operators with carbon emissions reduction goals can benefit from a shift to CNG or propane in their truck fleets. Where's the upside for investors? Ford's F Series pickups are already extremely popular with fleet operators, which are the typical customer for these trucks. But Westport Innovations has a significant opportunity with the F-150. Already the largest Ford QVMpartner, adding the V8 version of America's most popular truck, -- and the only half-ton alt-fuel model even available -- to its lineup creates big upside for this small company. However, Ford's slow build up of production has put fleet customers at the end of the line, so sales are not likely to boost Westport's results significantly in 2015. Looking ahead to 2016 and beyond, adding the F-150 with a V8 to the already broad mix of Ford trucks and vans that Westport can configure for CNG offers reason for optimism.